Work out smart to build those muscles. The classic bodybuilding physique is that attractive "V" shape with broad, toned shoulders; narrow, toned abs; and muscular legs. While you may not want to look like Arnold Schwarzenegger, you can achieve beautiful definition by following just a few bodybuilding fundamentals. Bodybuilding isn't as hard as you might think. The fundamentals include brief, challenging, targeted workouts; recovery days to let your muscles grow; and cardio to lose excess body fat. To get big results from weight training, you need to push yourself to your maximum effort. It's not enough to get sweaty; you need to force your muscles past the point of comfort to force change. Your sets should consist of 12 reps of an exercise. The weight you are using should be heavy enough that the last rep you do feels almost impossible to complete. When you push yourself past your comfort zone, you tear tiny muscle fibers. When you traumatize your muscle in this way, the body kicks into high gear to fix it. Fixing your muscle requires building it up bigger and badder than before. This is how you grow muscle for that classic bodybuilding physique. Since the rebuilding of muscle is how you get definition, it is just as important to give yourself a break as it is to make those tiny tears during your exercise. Split up your routine so that each muscle group gets some time off to recuperate. Concentrate on your upper body one day, your lower body the next, your core the third day and then repeat. Segregating your muscle groups allows you to keep working out five or six days a week and lets your muscle build up in between workouts. All the work you put into building up those muscles will be worthless if you can't show them off. Don't let layers of fat cover up all your hard work. Cardio is an essential part of a fitness program. Depending on your fitness level, do either two hours and 30 minutes of easy aerobic exercise or one hour and 15 minutes of vigorous aerobic training a week, as recommended by the Centers for Disease Control and Prevention. Keep it simple to get big results. It is better to isolate a muscle group than to do an exercise that uses your whole body. 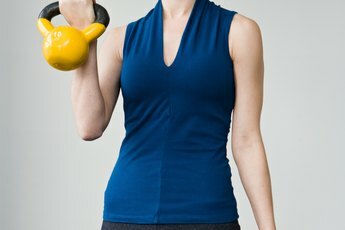 Simple moves that concentrate on only one or two muscle groups at a time are also easier to perform correctly. Good form is the key to successfully building muscles. If you're putting the time in to change your body, you want to be as effective as possible. Use targeted exercises to challenge isolated muscle groups and get killer definition.